Congratulations to the UCSD GPS Public Service Weekend Participants! Read the full story below published by UCSD School of Global Policy and Strategy, written by Anthony King and Sarah Pfledderer. Madeline Bell Hauenstein spent the last nine months working in South Africa and is curious about how nonprofits and the public sector work together to improve lives. Jessie Hernandez-Reyes wants to serve in Congress to confront inequities, representing the 51st district of California. 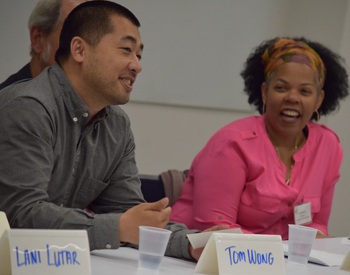 Nancy Nguyen — who experienced economic inequity firsthand while growing up — wants to break the cycles of poverty concentrated in communities of color. Ambitions considered, these three 20-somethings also share an eagerness to know if a career in public service is their best choice. And for one weekend, together, the UC San Diego School of Global Policy and Strategy (GPS) gave them a look into just that. Funded in part by a UC San Diego Office of Equity, Diversity and Inclusion (EDI) Innovation Grant, the School hosted a first-of-its-kind weekend retreat for underrepresented undergraduate students, showing them that careers in public service are not only interesting, but achievable. Thirty-two students from across California visited campus April 22-23, participating in discussions with faculty members and staff on building career skills, working in the public sector and applying to graduate school. The visitors interacted with current GPS graduate students and received a tour, focusing on the many campus resource centers. Jennifer Burney, an assistant professor at GPS and 2017 Diversity Award winner from the Office of EDI, said the impetus for putting together the weekend stemmed, in part, from a desire to develop a more diverse student pool for the new Master of Public Policy degree program. Burney said the weekend served as a path to expose and train diverse candidates for careers in public policy. Undergraduate students attending came from many University of California campuses, including UC San Diego, UCLA, UC Riverside and UC Berkeley. 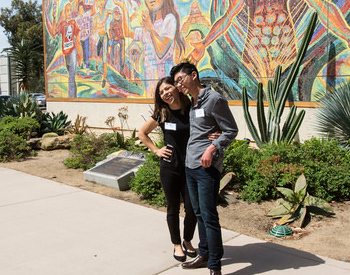 Some came from California State universities in San Diego, Long Beach and Los Angeles, while others participated from Point Loma Nazarene University and several of the region’s colleges: Palomar, Southwestern, Pitzer, Pomona, Scripps, Occidental and Pasadena City. To that end, Public Service Weekend organizers recruited speakers whose careers modeled the multitude of ways one can make a difference through their work. There are many ways to contribute, said GPS assistant dean Wendy Hunter Barker, thus the overarching purpose of the weekend was to assist students in discovering what next step is most productive. Tom Wong, associate professor in UC San Diego’s Department of Political Science, gave a colorful walkthrough of the obstacles he overcame as an undocumented immigrant growing up in a Southern California neighborhood infamous for gangs — ultimately building a support network that took him to a policy advisor position for the White House to improve the quality of life for Asian-Americans and Pacific Islanders. Former California Senator Denise Moreno Ducheny spoke to the students as well, painting her personal backstory about entering public service and, foremost, running for public office. She is now the senior policy advisor at GPS’s Center for U.S.-Mexican Studies. Former Washington Office on Latin America (WOLA) director Joy Olson also addressed students, treating them to a condensed version of WOLA’s advocacy training that has been used in communities in central America for decades to affect change. Additional speakers included GPS acting dean Gordon Hanson, Master of Public Policy faculty lead Zoltan Hajnal and School of Medicine Associate Director of Policy and Education Casey Cox. Students heard from elected-official representatives, community officers from the environmental, social, health and education sectors, and campus diversity leaders. In addition to the Office of EDI, sponsors for the weekend included the Public Policy and International Affairs Program (PPIA) and the Network of Schools of Public Policy, Affairs, and Administration. PPIA national director Simone Gbolo attended the weekend, which was the first in a series of PPIA’s Public Service Weekends in 2017, and underscored the importance of diversity in public policy careers. The UC San Diego Office for Equity, Diversity and Inclusion funds pilot projects that advance the campus Strategic Plan diversity goals. Grants up to $15,000 may be requested, with priority given to those who propose new, innovative projects that have the potential to create systemic changes addressing disparities in faculty, student or staff ranks at UC San Diego. Innovation Grant applications are accepted and reviewed on a rolling basis. The next proposal deadline is May 26.